Efforts to preserve agricultural land on the urban fringe put little emphasis on making farms more profitable. Public programs designed to slow farmland losses focus, for the most part, on tax relief. Although this helps, its primary benefit is a modest reduction in production costs. It does little to assure the level of earnings needed to keep these farms economically viable. The steady loss of farmland to urban development strongly suggests that traditional grain and livestock operations, which require substantial amounts of land, are not the best choice for urban fringe farming. It may make more sense to encourage farmers to phase out this kind of production and produce for local markets instead. A change to production of fruits and vegetables, for example, could increase gross income per acre several times over. It also would respond to growing consumer interest in local production of these and other high-value crops. Public interest in locally produced food is high in places like the Northeast, where much of the good farmland has disappeared, and the Seattle area, where the connection between farmland preservation and local food production has been dramatized through referenda (see Chapter 8). In most cases, however, the connection among consumer interest in locally produced food, the economic viability of farmers on the urban fringe, and farmland preservation is not well established. This may change as consumers become more aware of the growing vulnerability of the food system to energy shortages and price increases. In New England, for example, more than 90% of the food is shipped in and the supply lines reach to Florida and Texas and beyond. This level of dependence is not unusual for fruits and vegetables, even during the summer months, in many metropolitan areas. The most significant factor in removing the need for farmer proximity to consumers in recent years has been the technology of transportation, including refrigerated trucks using the interstate highway system. Rapidly rising energy costs and the possibility of diesel fuel shortages, however, are certain to reduce the reliability of this important sector of the food industry and focus increasing attention on local production. It appears that enough good farmland is left in urban fringe areas for production of high-value crops for local markets. Metropolitan areas contain only 16.7% of the nation’s land, and they have more than 20% of its prime farmland (Vining and Strauss 1976). It has been estimated that these metropolitan areas account for about 21% of the value of all agricultural products sold. Consumers have little direct input into the farmland preservation discussion. Most of the literature deals with topics like cropland classifi­cation, preferential taxation, agricultural zoning, and land preservation techniques. Much of it is written from the point of view of the outside expert, often an agricultural economist or a planner, who is interested in managing urban growth. Little is written from the point of view of urban consumers who usually end up paying the bill for iand preservation and wondering what they are getting in return. 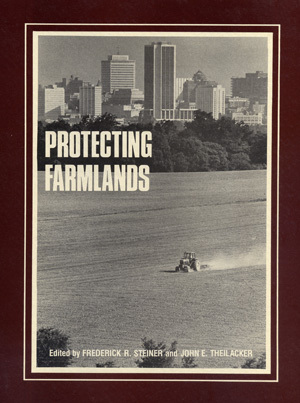 Approaches developed thus far for preserving farmland, with the exception of the purchase of development rights, are little more than holding actions (Blobaum 1974). Some cost more and some work better than others. But none has been able to stop the conversion of prime farmland on the urban fringe to nonfarm uses. They merely postpone it. The purchase of development rights, on the other hand, is an ex­tremely costly approach for any local unit of government and is difficult to sell to most city dwellers. The development rights program passed by King County, Washington, voters in 1979 had failed a year earlier to get the required 60% approval. It provides $50 million for the purchase of rights to about 10,000 acres (4050 ha). It is difficult to convince voters that purchasing rights is a good way to save land for corn or wheat produc­tion, or even to maintain a good dairy herd, when they know grain, milk, and meat will continue to be produced elsewhere. Another reason for their skepticism is that few make the connection between preserving close-in farmland and having locally grown food available at reasonable prices. Farmland preservation policy is often discussed in ways that suggest it has little to do with the production of food or the urban people who consume it. As long as farmland increases in value beyond the point where it pays to farm it, farmers will continue to sell out to developers. That point is reached fairly soon for grain, livestock, and dairy operations that nor­mally require 200 acres (81 ha) or more. Reaching a decision to sell is often helped along by the inconvenience of traveling long distances to buy feed and fertilizer, competing with urban employers for labor, putting up with vandalism, and dealing with nonfarm neighbors complaining about noise and odors. The challenge is to encourage farm operations that require much less land, utilize intensive production methods, specialize in high-value crops, and capitalize on opportunities to market locally. Farmers with opera­tions of this kind can afford more expensive land, and the higher taxes that go with it, and are much more likely to resist pressures to sell out to a developer and move on. These specialized farm operations also are more compatible with conditions usually present in the urban fringe. They have less need to move large machinery over public thoroughfares, avoid the odor prob­lems associated with large livestock or poultry operations, and are less likely to create noise and dust problems. They fit in better in the urban fringe environment and are much more likely to survive there. These rural-urban connections suggest the need for cities to consider developing metropolitan area food plans in the same way they develop areawide plans for growth management or the delivery of public ser­vices. Regional plans are adopted routinely for public needs like trans­portation, housing, education, and recreation and normally include the urban fringe areas. An areawide food planning element would appear to be a much-needed addition. A metropolitan area food plan would take into account the quality and availability of close-in farmland, the need to reduce dependence on food shipped from distant points, the need to deal with the lack of perma­nence and stability in nearby agricultural areas, the possibilities for extending the growing season with greenhouses, and the potential for recycling urban wastes on agricultural land. As it is now, the only food plan most metropolitan areas have is the one developed informally for the region by food wholesalers and retailers. It does not provide for direct local citizen input, does not take the local farmland base into account, and is developed from an industry stand­point by Safeway, A&P, and other regional and national food chains. It provides shipped-in fruits and vegetables on a year-round basis in most areas, for example, whether local consumers want it that way or not. Farmers on the urban fringe do not have anything to say about this food system either and their production, in most cases, is excluded. Schools and other public institutions that purchase large quantities of food do not have any input and neither do local units of government and other official bodies that set policy in metropolitan areas. Most people in urban areas take their food supply for granted. They know their local supermarket is dependent on a nationwide food pro­duction and distribution system. They seem content to buy fruit that is picked green and wonder why vegetables, and tomatoes in particular, do not measure up to what they see grown in neighborhood gardens. They do not realize that they are in a position to upgrade the quality of the food they buy by influencing where it is grown. Adoption of a food plan would focus the attention of urban consumers on urban fringe farmland, make them more aware of how important it is to preserve it, and help them make the connection between their own interest in food grown locally and the economic viability of the farmers who could provide it. It also would focus more attention on local efforts to preserve farmland and less on possible political solutions originating at the state capital or in Washington. An areawide food plan should strengthen the connections between the economic viability of close-in farms, the preservation of farmland in the urban fringe, and the food needs of urban consumers. It should include components dealing with production capability, agricultural stability, off-season production, direct marketing, and waste recycling. An initial step in preparing a food plan would be assessing the food production system already in place in the urban fringe area. Are the farms large or small? Are they conventional grain, livestock, or dairy operators or do they produce fruit, vegetables, and other labor-intensive crops? Are the operators of average age or do they tend to be older farmers nearing retirement? Do they own the land they farm or do investors or speculators own it? Production capability also is determined by the quality of farmland left in the urban fringe. It is not enough, however, to protect only land classified as prime by the Soil Conservation Service (Fenton 1975). Less productive land this close to markets also should be entitled to a prime classification on the basis of location. Even poor land that will produce fruit, for example, should be preserved if this food production effort is to respond to the needs of urban consumers. Farmers in the urban fringe often succumb to what is called the “impermanence syndrome,” a decreasing concern for the best production and conservation methods as the inevitable sale and conversion of the land approaches (Conklin and Dymsza 1972). This is accelerated when leapfrogging development surrounds individual farms or farm neighborhoods and large amounts of farmland are acquired by investors. A Connecticut survey found, for example, that about half the dairy operations in the state were operating on rented land available on a year-to-year basis (Josephy 1976). The dairymen involved had no incentive to take care of the land or to spend money modernizing their operations. Only when farmers are secure for a long period of time are they free to make long-term investments. These include barns, fences, and other capital improvements; soil-saving structures like terraces; and long-term investments like vineyards, orchards, and greenhouses. Young people often hesitate to start farming in these areas because they anticipate rising taxes, increased regulations, and other pressures associated with urbanization and assume they will eventually be forced to sell out. Farmers near retirement age tend to be the most likely to sell in urban fringe areas (Brown and Roberts 1978). Middle-aged farmers, who feel unable to start up a new farm and are not ready for retirement, tend to continue farming the longest as urban pressures mount. Lack of permanence also threatens the viability of agriculture as an economic venture. A minimum amount of productive land is needed to provide the economic base for cooperatives, implement dealers, feed and fertilizer suppliers, and other small enterprises that serve farmers. A study prepared for the New Jersey Department of Agriculture found that the minimum needed to support dairying was at least 90,000 acres (36,450 ha) of cropland and pasture and 26,000 cows within a radius of 30-50 miles (48.27-80.45 km) (Rutgers University 1973). These requirements ranged down to 10,000 acres (4050 ha) in a 10-mile (16.09 km) radius for vegetable and potato production, which would appear to make enterprises of the kind much more appropriate for urban fringe areas. The permanence problem would have to be addressed in any metropolitan food plan that called for local production. Solving this problem would be essential to maintaining the economic viability of the farmers involved. One of the areas of greatest potential for improving the economic viability of farmers in the urban fringe is expansion of greenhouse production. Although this system requires a lot of labor and is capital intensive, it will produce 15-20 times as much per acre as can be grown under field conditions. Before the interstate highway system was built, most of the tomatoes, lettuce, peppers, and cucumbers sold during the winter months in northern American cities came from greenhouses. The greenhouse industry has made considerable progress in finding ways to conserve fuel. In many areas, greenhouse production is now becoming competitive with shipped-in produce. Another option is construction of large solar greenhouses, a new approach that appears to be solving many of the industry’s energy problems. A 5000 ft2 (465 m2) demonstration greenhouse in Cheyenne, Wyoming, for example, has produced vegetables through three winters without any backup heat (U.S. Office of Consumer Affairs 1980). A food plan prepared for a metropolitan area could include a farmer-operated greenhouse component that would meet the need for much of the fresh produce sold during the winter months. It would be a major step in decreasing dependence on distant suppliers. Helping farmers produce on a year-round basis would go far in making them economically viable and in stabilizing the food production system in the urban fringe. An innovative approach started four years ago in Nashville, Tennessee, by the Agricultural Marketing Project now provides fresh-picked produce during the growing season to consumers in more than 50 cities in the Southeast (Hiese era/. 1979). Small farmers on the urban fringe have organized into producer cooperatives and are linked to urban buyers through regularly scheduled “food fairs” conducted on church parking lots. Elimination of middlemen keeps prices of vegetables, fruit, honey, and other food items well under supermarket levels. Another way close-in producers can cut costs is to invite urban consumers to pick their own. These pick-your-own operations, which provide significant savings in labor costs, are used for crops like strawberries. This approach also is used in some areas for apples, blueberries, and other fruit crops. In some cases members of food cooperatives pick produce as part of their monthly volunteer service. It is not surprising that lower prices result. The U. S. Department of Agriculture reports that farmers received only 25% of each dollar consumers spent on fruit and vegetables in 1979. Nearly 30% of the cost of fruit and vegetables went for packaging, rail and truck transportation, and advertising. Attempts also are being made to provide institutional markets for farmers selling locally. This was done in Massachusetts after it was noted that universities, hospitals, government cafeterias, correctional institutions, and schools accounted for 10% of the $3 billion spent in the state for food. A related approach is to have school districts contract with local farmers for fresh vegetables and fruit for school lunch programs. Some states use public funds to help bring local farmers and consumers together in farmers markets. There clearly are many things that urban consumers can do to help make farming profitable on the urban fringe. An areawide food plan would identify them and suggest how they could be implemented. Preserving sufficient close-in farmland to provide an option for urban waste recycling also is an important consideration for a city and the farmers in the urban fringe. Cities currently spend about $44 a ton (907.20 kg), or a total of $6.2 billion a year, to collect and dispose of waste (U.S. Environmental Protection Agency 1977). Most of it is dumped in landfills or oceans or burned in incinerators. Solid waste management costs more than doubled in the 1970s and are expected to more than double again by 1990. An assessment of the potential for applying urban wastes to agricultural land in a three-county Midwest region showed that nearly all the fertilizer required on more than 80,000 acres (32,400 ha) of cropland could be provided by the year 2000 by applying all the sludge, paunch manure, and livestock manure available from urban sources in the region (Blobaum etal. 1979). This study, carried out in the Omaha-Council Bluffs SMSA, treated the entire region as a waste recycling system that included close-in, privately owned land as an essential component. It was futurist in the sense that it attempted to show what would happen between now and the year 2000 if all suitable urban wastes in a region were applied at agronomic rates to close-in agricultural land. When urban wastes were composted and applied at the rate of 12 dry tons (10,886.4 kg) per acre (0.405 ha), for example, they provided all the nutrients needed in 5 of every 6 years under a 6-year rotation of corn, oats, alfalfa, and soybeans. Some nitrogen fertilizer would be required for the corn in the fifth year. By the year 2000, with increasing waste volumes and rising fertilizer prices, benefits to the region’s farmers in terms of supplying nutrients for crop production could exceed $1 million annually. Although the heavy metals content of sludge was not high enough to be a problem in the Omaha-Council Bluffs region, it would limit land application in many more industrialized areas. Farmers producing root crops would have to exercise considerable caution. What is needed, of course, is a ban on certain manufacturing and fabrication operations and pretreatment at the source for wastes released into public sewer systems. There is a tendency for the experts to focus attention on government-sponsored programs for preserving farmland and for policy makers to commit public funds that support that approach. The urban input, for the most part, is strongly influenced by developers, builders, and financial institutions that view farmland in the urban fringe as an unrealized opportunity. The time has come to challenge urban consumers themselves to begin participating more fully and directly in the effort to preserve farmland and to develop a rationale for doing this. Preserving the farms on the urban fringe, and making them economically viable, is just as important as saving the farmland. Indeed it is part of the farmland preservation effort. Preserving open space and the rural character of land in the urban fringe is not enough by itself to attract the public support needed to commit large amounts of funding. A connection must be made among urban consumers, the economic viability of farmers on the urban fringe, and farmland preservation. Developing and implementing a metropolitan area food plan is a good way to do this. Blobaum, R. 1974. The Loss of Agricultural Land. A study report to the Citizens Advisory Committee on Environmental Quality, Washington, D.C.
Blobaum, R., Fast, S., Holcomb, L., and Swanson, L. 1979. An Assessment of the Potential for Applying Urban Wastes to Agricultural Lands. A report prepared for the National Science Foundation, Roger Blobaum & Associates, West Des Moines, IA. Brown, H.J., and Roberts, N.A. 1978. Land Into Cities: The Land Market on the Urban Fringe. Department of City and Regional Planning, Harvard University, Cambridge, MA. Conklin, H. and Dymsza, R. 1972. Maintaining Viable Agriculture in Areas of Urban Expansion. New York State Office of Planning Services, Albany, N.Y.
Fenton, T. E. 1975. Definitions and criteria for identifying prime and unique lands, in Perspectives on Prime Lands: Background Papers for a Seminar on Retention of Prime Lands. U.S. Department of Agriculture, Washington, D.C.
Hiese, L.Jones, L.,and Vlcek,). 1979. Everything You Ever Wanted to Know About Food Fairs. Agricultural Marketing Project, Nashville, TN. Josephy, R. 1976. Farming in the Urban Northeast, presented at the annual meeting of the American Association for the Advancement of Science, Boston, MA. Rutgers University. 1973. Issues in Agricultural Land Use Management in New Jersey, Spec. Rep. No. 17. New Brunswick, N). (February). U.S. Environmental Protection Agency. 1977. Resource Recovery and Waste Reduction. Fourth Report to Congress, Washington, D.C.
U.S. Office of Consumer Affairs. 1980. Rural community greenhouses, in “People Power: What Communities Are Doing to Counter Inflation.” Washington, D.C.
Vining, D.R., ]r., and Strauss, A. 1976. A Demonstration That Current De-concentration Population Trends Are A Clean Break With Past Trends, Discussion Paper Ser. No. 90. Regional Science Research Institute, Philadelphia, PA.